A few years ago we saw a huge trend in men socks take flight. They were bolder, brighter, with strong patterns. It became the center of attention in a lot of outfits. While this hasn’t gone away quite yet, you’re seeing this shift to other parts of a man’s wardrobe – mainly accessories like pocket squares, ties, and now watch straps. I’ll admit, when I first saw the Vario NATO strap I was skeptical. I almost immediately wrote it off as something I thought to be gimmicky. Then my review strap arrived in the mail, and upon seeing it in person I started to change my tune a little. I received the ocean chevron strap, and added it to my Timex Easy Reader watch, pictured below. 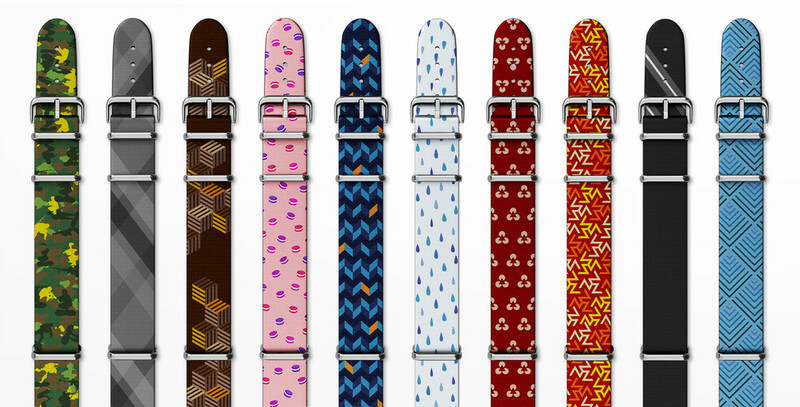 This strap has a lot of personality. Pictures don’t do it justice. If worn correctly it adds a nice little touch to an outfit. As the weather starts to warm up in the coming months this is going to be a great way to add some strong color to your wrist. Vario is offering a decent selection of patterned NATO straps, whether you’re looking for something bold or a bit more subtle. “Wear your Personality” is their tagline, and looking at their lineup of watches, I easily found the exact band I’d choose for myself. With a watch band this bold, it’s important to make sure that the patterns won’t clash with the other pieces in your outfit. I recommend keeping your shirt a clean solid color. No stripes or patterns, or else the patterns on the watch band might get lost. But keeping a solid complimentary shirt lets the watch stand out on it’s own with no competition. This is very much a situational band as well. By that I mean you’ll want to wear a band like this outdoors; somewhere like the beach, pool, or a summer party. This isn’t the type of band you’re going to dress up in any fashion. Keep it very casual and fun. If you’re someone looking to add some flair to your spring/summer wardrobe, this is a great way to do so. It might not be this exact band that I have, but their other options might fit your tastes instead. Also, if you’re someone that’s looking to branch out with accessories, this is for you. Since the watch is one of the best accessories you can have, having a fun band like this mixes it up from the everyday leather, or solid color band. As mentioned earlier, at first glance this band feels gimmicky. But after giving it a go, I approve of it as a fun addition to add to a warm weather wardrobe. They have an Indiegogo Campaign that just started and it’s off to a great start. So go support and get yourself a funky band to add to your collection.